35 years ago tonight (1979): Billy Harris scored a natural hat trick as the Isles rolled to a 6-1 victory over the Hartford Whalers in the first ever meeting between the teams. 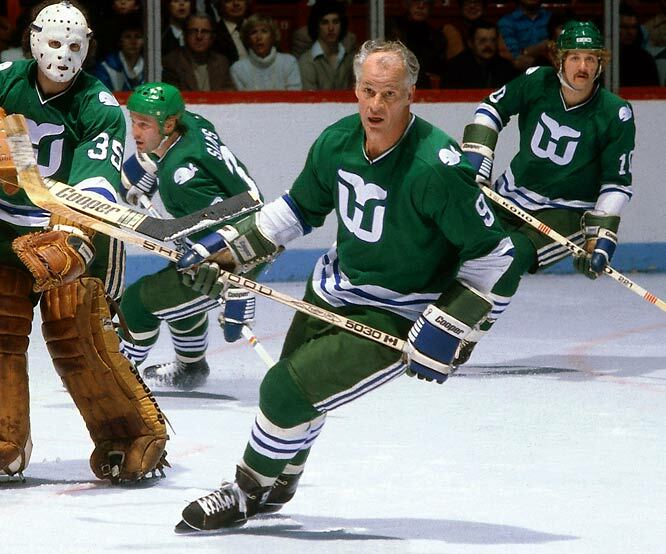 Gordie Howe appeared in the game for the Whalers and got into the boxscore with a late elbowing penalty. The 51-year old grandfather explained “I was tired by then. (Garry) Howatt jostled me with his stick, so I thought I’d give him a quick one, and damn, the referee (Andy van Hellomend) was watching”. In addition to 801 goals and 1850 points in 1767 NHL games, “Mr. Hockey” recorded 1685 NHL penalty minutes. Also on this date: (1984) Mike Bossy has four goals in an 8-3 win over Los Angeles; (2001) The Isles retire Bryan Trottier’s #19 before a 2-2 tie with San Jose. All-time, the Isles have played twelve October 20th games at the Coliseum and finish with a 8-3-1 record on this date at 1255 Hempstead Turnpike in Uniondale.